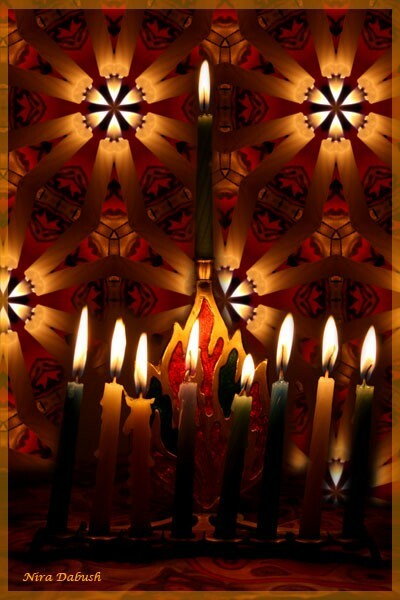 Dec,21,08 is the evening of Hanukkah - First Candle . Because there is always LIGHT, if you wish to see... And every and each of us is a miracle. Religious - Tradition Art/Drawing Misc. Very beautiful, Nira! Happy Holidays! Artist Reply: Dear Anne, thanks so much. Happy holidays... All the very best wishes for 2009. Nira. Beautiful, seasons creetings to you Nira. Artist Reply: Dear Peter, thanks for the visit here... Happy holidays to you and yours. Good evening from Israel, NIRA. You picture has a complex beauty. Happy Hanukkah to you, too. It is such a lovely tradition. So many cultures have mid-winter lighting of candles or fires. Even the Cajuns in Louisiana light bonfires along the bayous. Artist Reply: Yes.. I agree with you, David. I think the light of candles or bonfire is truly wonderful, in different cultures. Happy celebrations of LIGHT.... Thanks for the visit, Nira. Artist Reply: Thanks so much X2 Dear anony... Happy Hanukkah! to you and yours. Surrounded by Water & Leafs..